Do you worry that too much media input is having a negative impact on your child? TVs and computer games are easy ways to keep kids occupied. 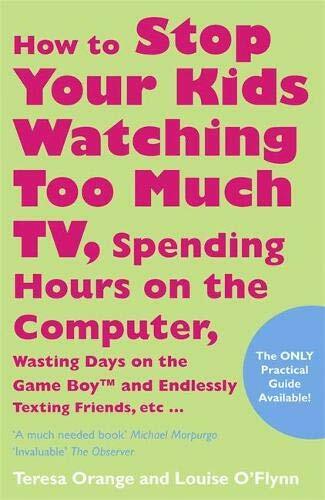 But if you, like many parents, are worried that your little ones spend far too much time in front of a screen, this guide is for you. Offering practical methods for reducing screen-time and ideas for other more productive activities, this useful book will help ease your mind. Teresa Orange has a high-powered career in advertising. She is the industry spokesperson on advertising and marketing to children, working with brands such as Hasbro, Mattell, Disney, and Unilever. She is an expert qualitative researcher with an in-depth understanding of the ages of childhood development, childhood emotions and the relationship children have with brands and advertising. Louise O'Flynn is a communications professional who has had twenty years' experience working with the national media. She is currently a freelance writer and media consultant. Amongst other subjects, she has researched and written a number of publications on children and the use of mobile phones previously she was Director of Public Affairs at Camelot where she was in charge of leading the campaign that successfully retained the lottery license. Both authors are mothers of young children.